This is a core image filter that takes a greyscale heightfield (bump map) image, and outputs a normal map, in the style of nVidia Normal Map Filter plugin for photoshop, or NMG. This allows one to create greyscale imagery in Quartz Composer, run image through this filter, and generate normals that can be rendered in the GLSL shader. This example uses Christopher Wright's Normal Map 1.qtz as a rendering destination, to show how it works. 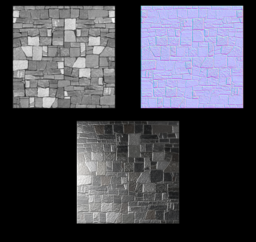 Normal mapping is used to fake the appearance of a higher poly mesh than is actually being used when using GL Lighting. A simple example that uses Kineme ChartTools to plot a point on an XY graph every time the user presses the up or down key. It will require GL Tools, AlphaBlend, and Kineme3D. Inverted depth buffer output (now near=light, far=dark). Added Device ID input (to select among multiple Kinects connected to the same host). Color fringes on RGB image. Kinect model 1414 is supported, but Kinect model 1473 is not supported. An implementation of Core Image functions from GPU Gems 3. Adapted by @jstrecker and @smokris. Get a colored object to track, such as a marker. Calibrate the color: Click Input Parameters, click Color, click the color picker (magnifying glass) in the color dialog. Hold up the object to the video camera and click on it. Adjust the Threshold until the object and nothing else is highlighted (as much as possible). The white circle should follow the object. The framerate is slow (on my machine, 8-10 FPS for a 256x256 image). Any suggestions welcome. It needs square images with height & width a power of 4. (The input image is automatically adjusted.) With extra math you could get rid of this restriction. Simple example: The keyboard controls a cube's rotation. Simple example: Cubes in a line jump up one after another.